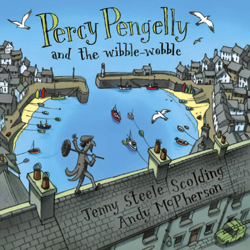 Cornwall has some wonderful children’s writers and illustrators, some of whom self-publish. Do search them out, they are so talented and deserve to be widely read. Tintin has just been translated into Cornish, so for those of you bringing up your children to be bilingual, or anyone who is fascinated by the language this is brilliant. The English version is ‘The Black Island’, and Tintin and Snowy (or Milik in Cornish) set off to hunt down a dastardly gang of forgers. Every generation loves Tintin, perhaps the greatest comic series of all time. Also recommended: ‘Stormbreaker’ by Anthony Horowitz, published by Walker, an Alex Rider story, set in Cornwall, for 9+, Helen Dunmore’s trilogy ‘Ingo’, published by Harper Collins for 10+ and don’t forget Michael Morpurgo’s wonderful Cornish stories, including ‘The White Horse of Zennor’, published by Egmont. This is a simple retelling of the birth of Jesus with gentle illustrations which will introduce very small children to the real story of Christmas. A nice chunky book with lots of brightly coloured cars which all need to be repaired at Stanley’s garage. A perfect book for car-mad toddlers. On the eve of the centenary of the outbreak of the First World War, it is important to look at books which commemorate this appalling event. What a challenge to introduce young children to the awful concept of war. Using the rhythm of ‘The House that Jack Built’, the story builds up from a field of poppies where two friends play to the battlefield and the horror. Moving and very sensitively done. John Boyne leapt to fame with The Boy in the Striped Pyjamas and this is his First World War story about a young boy whose father suffers shell shock and the implications on the family. The reality of mental illness is rather underplayed, naïve even, but then this is a story for children of 8+ and tackles a very difficult subject.